The most common type of mutant. 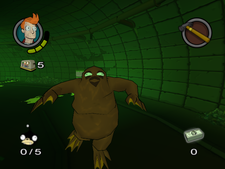 The sewer mutants are a type of enemy which appear in the Futurama video game, found in the New New York sewers. Unlike regular sewer mutants, who have built their own civilization, these ones are a species of primitive, violent monsters incapable of speech. There are four types of mutant. The two most common ones are fish-like monsters: the darker ones which are only capable of slapping, and the lighter ones which can pick people up and shake them violently. A third type resembles an octopus, but hides in pipes so their full bodies cannot be seen. They pull in any human who approaches them and kills them instantly. The fourth type resembles a long eyestalk and hides in the Lake Mutagenic. A bigger, more deadly mutant. This page was last edited on 3 August 2014, at 22:00.